When a tofu-based vegetarian dish can make a bloodthirsty carnivore whimper with anticipation, it has my attention. Perhaps you know this type of guy, to whom bread is a vegetable and health food is a fast food burger with a side of cigarette. The kind of person who gets almost as much pleasure offending a vegan as chewing on part of a dead animal. One such person, whom I will call Bloody Brad, was my unlikely guide. What I got instead was a recommendation for the Van Loc Vietnamese restaurant, now shuttered after 28 years. Vietnamese cuisine can be heavy on red meat, and Van Loc offered an eight-course beef meal. But Bloody Brad had one specific recommendation: Clay Pot Tofu. So I went to Van Loc and ordered Clay Pot Tofu. When it arrived, boiling at my table, I could see black pepper coating large pieces of celery, whole shitake mushrooms, and golden chunks of deep-fried tofu, which stayed crispy in the peppery broth. As I took a few tiny sips of Bloody Brad’s beloved broth, that black pepper jumped out. I don’t see too many spicy dishes powered by black pepper alone, with no backup from chile. But then, Vietnam produces and exports more black pepper than any other nation, so why not? While the pepper was strong, the overall effect was still subtle somehow, perhaps thanks to celery taking a rare post at center stage. The tofu absorbed the flavor around it but held its own. It’s a solid, intriguing, and satisfying dish. The short answer is yes. It may strike some as counter-intuitive, because it’s common to conflate tofu-eaters with vegetarians, but bacon and tofu is a great combination that’s popular in many Asian dishes. A shorter answer would be: fry the tofu in bacon grease, or with ground pork, and then proceed. But honestly, you might want to save your bacon. I’m not sure this dish can get any better. Before you do anything, slice the tofu. Heat fry oil in a wok or deep skillet to 365 degrees F. and deep-fry the tofu until it turns golden-brown and crisp, about 5 to 10 minutes. Alternatively, pan-fry the tofu slabs in less oil on medium, flipping the slabs to get both sides crispy, about 25 minutes. Remove the tofu and drain on a plate covered with paper towels. Move the fried tofu far, far away, so you won’t be tempted to eat it all before you serve the soup. In a clay pot or saucepan, heat 3 tablespoons of oil on medium heat and briefly saute the garlic about a minute. Add the onion, mushrooms and celery. Add the soy sauce, lime juice and black and white pepper, and four cups of water. Stir it together and season with soy sauce, black pepper, lime and fish sauce. 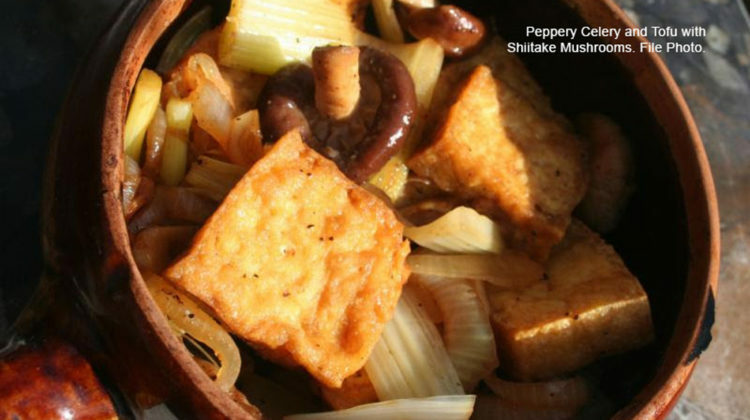 Add the crispy tofu chunks, so that they are half-submerged in the saucy stir-fry. Cover and cook 10 minutes on medium heat. Serve immediately by placing the simmering vessel on a hot pad and let that piercing broth do its peppery magic.